Gaston Ramirez headed his second goal of the season as Middlesbrough made hard work of claiming a crucial Premier League win over relegation rivals Hull at the Riverside Stadium. The Uruguayan marked an impressive performance by stooping to head home a Viktor Fischer corner on the hour and end his side's worrying run of three straight top-flight games without a win. Boro dominated throughout and missed a catalogue of chances against the woeful Tigers who nevertheless almost grabbed an unlikely point in injury time through Adama Diomande. 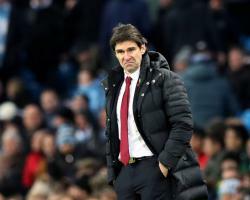 Boro had much the better of an eminently forgettable first half, even if the Tigers did fashion the first chance when Sam Clucas was dispossessed on the edge of the box by the alert Marten de Roon. If the small section of visiting supporters hoped that would herald a significant assault from their side they were to be disappointed as the hosts would dominate the remainder of the early exchanges. De Roon played a neat through-ball to Alvaro Negredo who should have done better than blast his shot over the bar, then a left-foot drive from the dangerous Ramirez was parried by Hull keeper David Marshall. Clucas blasted well over the bar from a Robert Snodgrass corner before normal action resumed, Adam Forshaw and Ramirez bringing saves out of Marshall before Fischer bundled the ball into the net only to be ruled offside. A rare counter-attack from Hull gave a glimmer of a chance to Diomande before he was capably dispossessed by Ben Gibson, then Negredo again should have done better with a cross from out wide by Forshaw. The second half continued in the same vein, Fischer failing to get a touch onto a Ramirez ball across the face of goal, and Boro's profligacy in the 18-yard box was beginning to frustrate the home fans before they finally made the breakthrough on the hour. Fischer, preferred in the starting line-up to Adama Traore, delivered his dangerous set-piece from the left and Ramirez stooped at the far post to nod home the opening goal from point-blank range. Boro continued to push forward without creating too many clear-cut chances, Negredo spurning the best of them when he headed straight at Marshall from a Fabio cross. Nerves continued to jangle at the Riverside Stadium despite the Tigers - shorn of the suspended Dieumerci Mbokani and injury victim Abel Hernandez - offering next to no attacking threat. But out of nowhere Diomande - stranded up front for the entire game - almost became Hull's unlikely hero when his speculative long-range effort was flapped around the post by Boro keeper Victor Valdes. From the resulting corner by Snodgrass, Ahmed Elmohamady flicked on and the stretching Diomande was inches from connecting for what looked a certain goal in injury time.